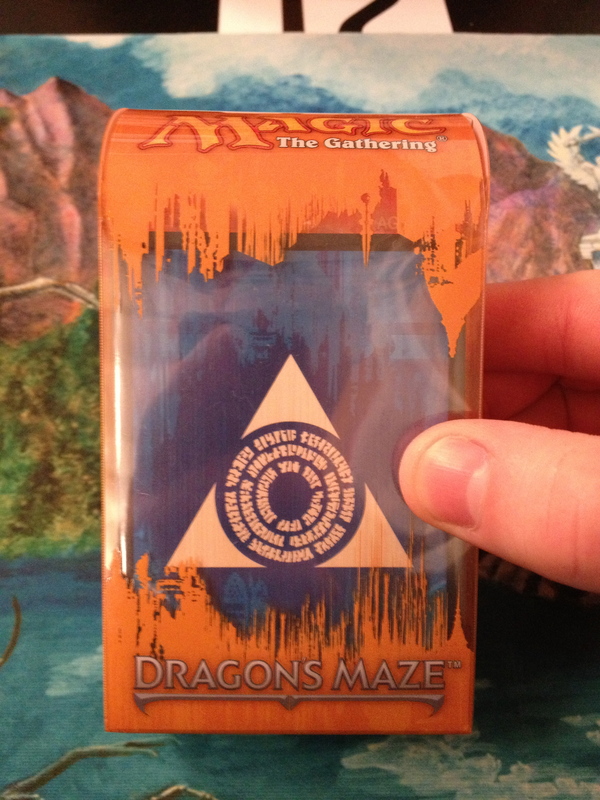 After writing my review of all the Dragon’s Maze commons, I felt super-prepared for the prerelease—more so than usual. I got my first-choice guild—Orzhov—and my secret ally was Azorius. The Orzhov guildpack was pretty good, with a Kingpin’s Pet, Smite, Devour Flesh, Basilica Screecher, and Luminate Primordial as the rare, while Azorius had not much great beyond a Lyev Skynight—the rare was Palisade Giant. BOO. I thought the boxes they had the packs in were pretty cool. Basically my deck’s plan was to stall on the ground and win in the air, although I figured it could also get aggressive, given my removal, combat tricks, and decent two-drops—plus support from Haazda Snare Squad, who I had previously theorized would be good. I was a little worried about how my fixing—and the speed of the format—would play out, given that I was splashing both red and blue in my Orzhov deck, so I made some late cuts in order to slightly reduce the splashes. Also, I could have included any number of cluestones (I had roughly a billion), but I didn’t think my deck wanted them. If you are using cluestones to splash, you are rarely ever going to be able to cycle them; and if you are going to be able to reliably cycle them, then you probably don’t need the fixing. They seem really schizophrenic. 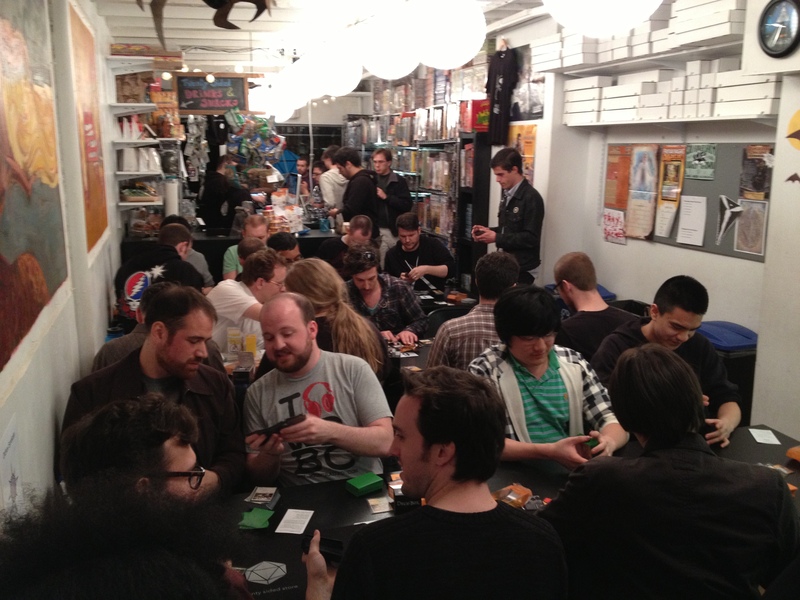 The scene at 20SS during the 3pm sealed flight. Passing Matt Jones on the way to my table, I told him I was paired up against Hugh for R1, and Jones was like, “Good luck, his deck is sick. He’s got a Ruric Thar and bunch of other stuff.” Also Hugh’s a great player. I forget whether or not I won the die roll, but pretty much all day I chose to draw, when given the chance. That’s sometimes the correct play in sealed, anyway, and I figured—at least given what I’d seen of my own deck, and the decks around—that this format was going to be especially so. That wasn’t entirely the case, but it was close. Hands of Li-nding (this caption brought to you by the 1997 Catholic High Yearbook Committee). After 8pm at 20SS, it gets a little blue. 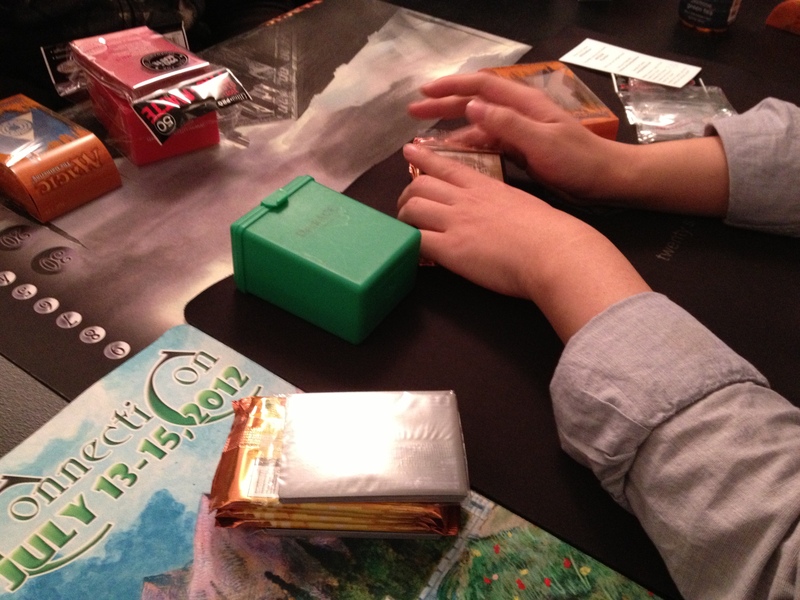 Final thoughts: I never had a problem playing my spells, despite having a four-color deck. Part of that, I’m sure, was luck—but having five guildgates and a Transguild Promenade did a lot of heavy lifting in the fixing department. Transguild Promenade, in particular, seemed really good and not at too slow, as it often did in Return to Ravnica. I dunno how many games started with both me and my opponent going land, go, land, go, land, go for three turns in a row—but it was quite a few. Haunter of Nightveil, as I said, was a real MVP, and Jelenn Sphinx seemed quite strong as well, although he (she?) didn’t come out to play nearly as often (just didn’t draw her). Warleader’s Helix was bonkers, of course, and Smog Elemental’s stock went way up, often killing a bird or two. Fatal Fumes took a little effort to make it work, as it seemed like, by turn four or five, that you no longer wanted to use it to kill a two-drop. That’s all I’ve got! 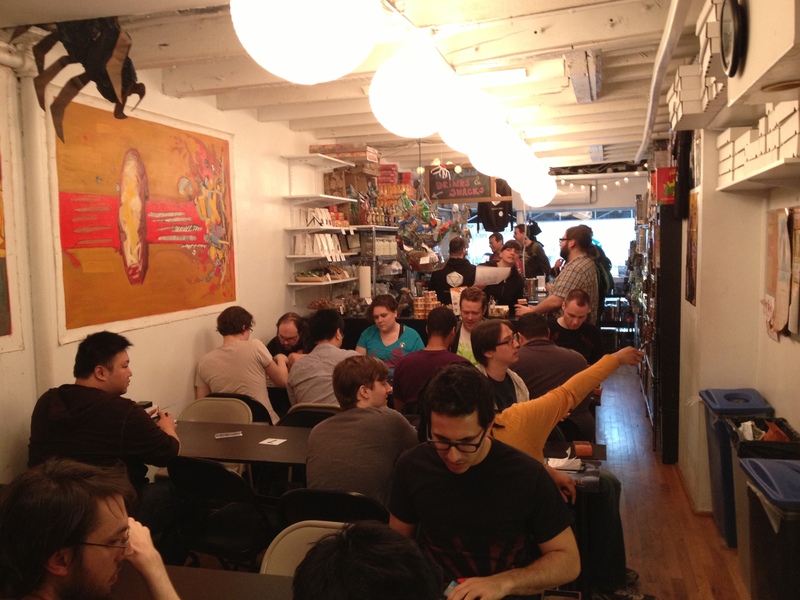 If you see me at the team sealed event in Somerset, NJ, this Sunday, definitely say hi! I’m teaming up with Matt Jones and Kadar “History’s Greatest Monster” Brock. Team name is still TBD but I’m thinking something like the Forebrock Hunters. It’s not as good as the Commie (or Christian) Hunters, but it’ll have to do. Suggestions welcomed! See you guys in the top four.